H: 14 ft. x W: 8 ft. x D: 2 in. 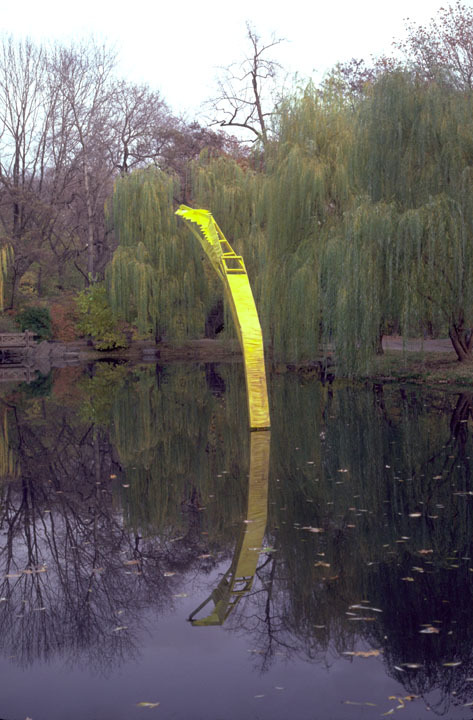 This piece was a collaboration with Creighton Michael, placed in the Lake of Central Park as part of a summer outdoor sculpture show currated by Horace Brockington in 1983. The piece was anchored by cement blocks on a triangular submerged base. Michael’s work at the time employed nylon fabric; Nickel was making constructions of wood. The piece was assembled on shore and installed by Nickel in a row boat and Michael in chest waders, guiding the piece into position.